Cavalier King Charles Spaniel Dogs - The Cavalier King Charles Spaniel is a small breed of dog usually considered one of the toy dog breeds. The Cavalier is by most measures the largest toy breed, though clearly a lap dog, fully-grown adults tend to fill one rather amply. Nonetheless it is quite small for a spaniel, with fully-grown Cavaliers roughly comparable in size to an adolescent of a more conventional spaniel breed. This information is licensed under the GNU Free Documentation License. It uses material from the Cavalier King Charles Spaniel article on Wikipedia.org. Cavalier King Charles Spaniel Breeders - Advertise your kennel puppies and dogs here. Kingdom Cavaliers - Texas - We are "hobby" breeders and show hopefuls. Our Cavies are our family, and are treated accordingly. Puppies are well socialized by our six children:) Emphasis is placed on natural nutrition and homeopathic remedies. Healthy puppies will occasionally be available. 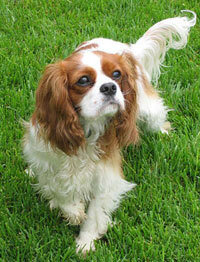 We have many Cavalier products on our web site, plus natural health products.